With Fendt VarioGuide you can drive reliably and accurately without actively steering, even in difficult reception conditions. 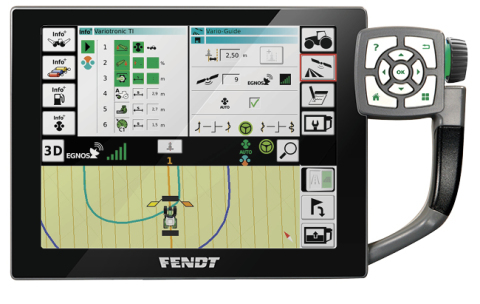 With the new version of Fendt VarioGuide, you can choose from the GNSS receiver NovAtel® or Trimble®. A number of correction signals are supported, depending on the receiver, for example, EGNOS/WAAS or also rangePointd™ rTX, centerpoint™ rTX™, Ntrip. Existing Trimble® rTK infrastructures, such as NTrIP can continue to be used. Even without a correction signal, VarioGuide works reliably for up to 20 minutes with rTK accuracy via Trimble® xFill™ technology. With the fully automatic Sectioncontrol, you can always plant seeds, spread fertiliser or apply pesticides precisely in the right spot. This prevents double treatment and distances are automatically maintained. With the aid of the Sectioncontrol assistant, you can set the correction values for each implement quickly and easily. The switch on and off points are set precisely from the very beginning, which automatically results in economical application. The VariotronicTI headland management saves all the procedures when performing a turning manoeuvre. VariotronicTI automatic triggers the sequences precisely at the right place. The new solution for precision farming, variable rate control function (Vrc), is now available in combination with Variodoc Pro. 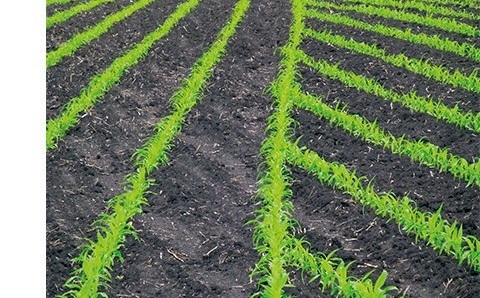 The need for operating inputs, such as seeds, fertiliser or pesticides, is shown on application maps, which can be called up during operation and automatically executed. The big advantage: operating inputs can be defined and planned in the field database and then applied with utmost precision. The data from the field is saved in the field database by VarioDoc. VarioDoc Pro adds recording of GPS position data and data transfer in near real-time. You can plan and control your fleet for optimal utilisation using the AgCommand™ telemetry system. With Fuse Connected Services, you can increase the operating time of your machines through service and maintenance offerings per remote access. 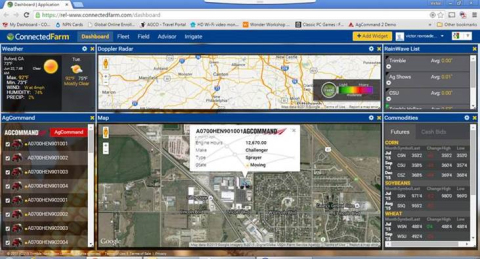 AgCommand™’s open API interface allows telemetry portals from other manufacturers to be incorporated, e.g. Trimble Connected Farm. Communication between AgCommand™ and the machines is carried out via the normal GSM mobile network or, if not available, via Iridium satellite radio. The operating strength of your fleet is optimised as soon as the machines are connected meaningfully with each other. The latest interfaces and software solutions already allow the machine data to be called up independent of location and immediately react accordingly. This way you can increase the reaction and operating times of your entire fleet at the push of a button. Control additional services via remote access, achieve higher machine utilisation. The AGCO telemetry system AgCommand™ transfers important machine data in near real-time for active fleet management. Significant here are primarily the fuel consumption, speed, operating hour counter, engine speed, torque requirement, PTO speed and outside temperature. Based on this data, the settings can be adjusted and optimised during operation and further measures can be planned in advance. The Fendt 1000 Vario opens a new world – for performance and operating times. It sets the starting point for new connection technologies, to increase efficiency and machine availability. United under the name Fuse Connected Services, the machine management, technology, services, diagnostics and consultation complement each other to optimise operations. 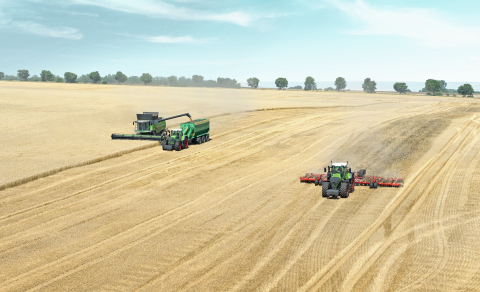 The AGCO Connectivity Module (ACM), the integral telemetry unit for the entire data transfer, forms the interface between the tractor and Fendt service partner. That means economy, operational reliability and retention of value that you can count on. In short: Fendt 1000 Vario. With Fuse Connected Service, you can call up the diverse consultation and service features offered by your Fendt dealer directly over the Varioterminal on your tractor. This way you can increase uptime during operation. An up-to-date tractor always has the highest value. At Fendt, you get the latest software update for your Fendt for free when you go in for servicing. We are proud of the long lifetime of our machines. It is the best proof for quality, on which we are continually working. Your tractor’s retention of value begins with the use of the best components, first-class workmanship and strict quality testing. Because we trust our high quality standards, we offer a extended warranty of up to three years on all parts for our maintenance contract. Retention of value also includes the latest software, which is updated for free every time the machine is serviced. With the comprehensive fault diagnostics, troubleshooting and maintenance via terminal remote access, you can address problems with the Fendt 1000 Vario before they happen. For example, your certified Fendt dealer can upload software updates, with your approval, as part of the Fuse Connected Services. Preventative diagnostics, monitoring of the machine state as well as ad-hoc consultation and training improve running operations, no matter where the tractor is working.